These Bollywood Celebs Kept Us Updated On FIFA Finale All The Way From Russia! FIFA fever took over the world last night and Bollywood biggies were all for it too! With the level of talent France and Croatia showed, we don't blame the stars at all. Many stars from Bollywood including Amitabh Bachchan and Ranveer Singh were watching the match live at Luzhniki Stadium in Moscow and their tweets and posts mirrored their excitement. While celebrities congratulated France for winning the trophy, they did not forget to laud Croatia on their heart-winning performance. 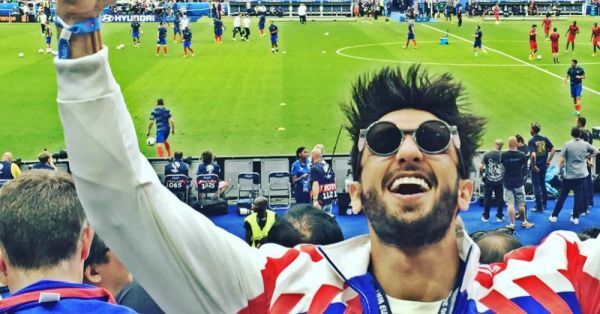 Here's what B-town celebs had to say about the refreshing game between France and Croatia. All in all, a wonderful @FIFAWorldCup . Positive, engaging football all around, some lion hearted performances from the ‘minnows’, generally quality refereeing and barring some exceptions, VAR made things more equitable. And that's how it's done #France ❤ Champions !!! #Croatia be proud .. you fought hard !! Was a great World Cup. Will miss the games tomorrow onwards. Will miss hanging out here on twitter with all of you too. Congratulations to France on winning the world cup!!! While most of Bollywood seemed to be rooting for Croatia, France took the title of FIFA World Cup 2018. Both the teams made the match worth watching but Croatia Football Team and their president stole our heart! We loved how President Kolinda Grabar-Kitarović hugged her team with love, smile and respect despite not winning the trophy. Which part was your favourite? We would love to know!